It’s Zucchini time again! Time to share zucchini and summer squash recipes. Some of my favorite casseroles are made with summer squash and this is one of those recipes. This casserole is great as a side dish or as a meatless main dish. You might think, “Squash Casserole for a main dish?” You bet! I like to serve a delicious squash casserole for dinner with a dish of fresh baked bread and creamy butter. Delicious! 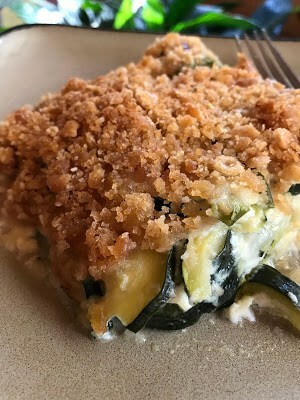 Zucchini Squash Casserole is made with both zucchini and yellow summer squash. It’s the perfect dish to highlight fresh farm market or farm stand squash. 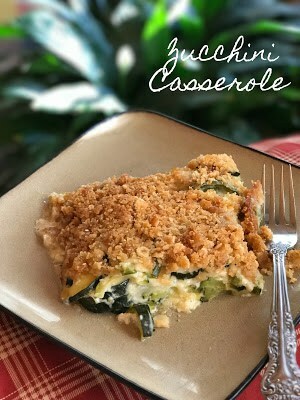 If your family isn’t keen on zucchini or yellow squash, make this casserole with what works for you. Another great thing about this casserole, it’s versatile. If you aren’t crazy about Swiss cheese, use whatever your family likes. Make this casserole whichever way that you like. My hubby doesn’t like zucchini at all. But, if you were to ask him whether or not he liked zucchini, he’d say, “I love zucchini!” “I love zucchini bread and zucchini cake.” Really dear? 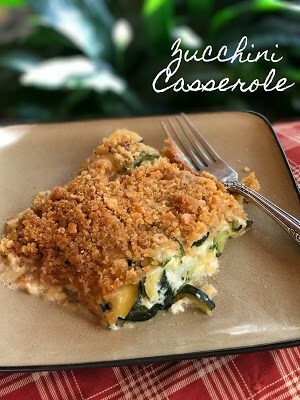 Actually my favorite part of this casserole, besides the zucchini and summer squash is the cracker crumb topping. There’s just something about a casserole with a cracker crumb topping. 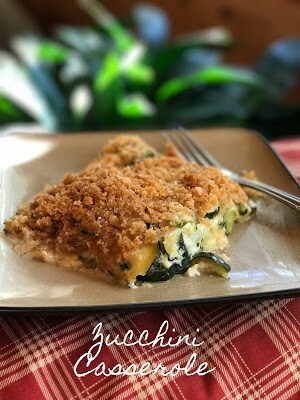 I love a cracker crumb topping and that’s probably why I tend to put a cracker crumb topping on every casserole I make. I would put a cracker crumb topping on my cereal if I could! As I’ve mentioned before, my hubby does not like any vegetable that is green. Absolutely None. No peas, green beans, asparagus, zucchini, broccoli, artichokes, and any other green vegetable you can think of…I feel sorry for him, he doesn’t know what he’s missing:) I on the other hand, love green veggies. I still think the reason why he doesn’t like green vegetables stems from his childhood and the fact that his mom always made canned vegetables and let’s face it, most canned veggies are green. At least Carlene made veggies, Aggie never bothered. 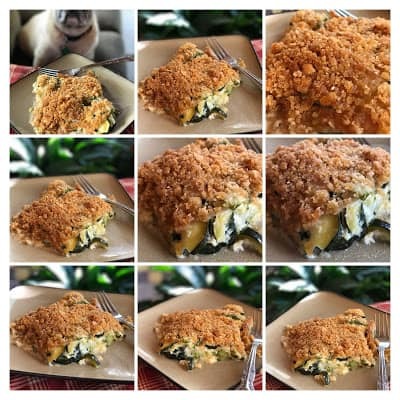 A delicious squash casserole with a cracker crumb topping. Heat olive oil in a large skillet over medium heat. Add the onion and bell peppers and saute until softened, 5-7 minutes. Stir in the garlic and cook until slightly softened, about 1 minute longer. Season with salt and pepper. Saute 2 to 3 minutes longer. Sprinkle flour over vegetables, stir to combine and let cook 1 minute over medium heat. Slowly add the half and half, stirring constantly until mixture thickens and is bubbly. Remove from heat and stir in 1 cup of cheese. Stir until cheese has melted, set aside. Lay half of the zucchini and summer squash slices in 3-quart baking dish that has been sprayed with non-stick cooking spray. Top with half of the onion/half and half mixture. Repeat layers ending with onion/half and half mixture. Cover and bake for 30 minutes. Uncover, bake for 15 minutes longer. Remove dish from oven and uncover. Sprinkle remaining cheese over the top. Melt butter and honey in a small bowl in the microwave. Mix together cracker crumbs and melted butter mixture, sprinkle mixture over cheese. Bake, uncovered until the casserole is bubbly and the topping is lightly browned, about 15 to 20 minutes longer. We love a good casserole. In fact, I grew up eating casseroles and I made them often when I was a young mother and I had to learn to stretch my monthly food budget as far as possible. Casseroles were a way to do just that. A few inexpensive ingredients could be added to a baking dish, usually combined with a condensed canned soup, baked in the oven or crock-pot and wham..dinner was served. Here are a few of our favorite casseroles you might like to try. Creamy Ham and Swiss Noodle Bake, Tuna Noodle Casserole, Special Shrimp Bake and Shrimp and Artichoke Alfredo Bake.